Peacocks is the common name of Peafowl which are of the family of Phasianidae and closely related to pheasants. 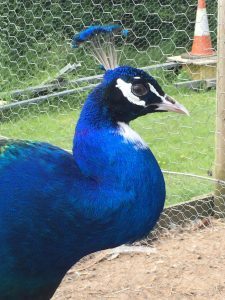 When looking after peacocks there are a number of ways you can keep them safe. In the UK Peacocks have very few predators so looking after peacocks is easier than in other countries . The fox is the main predator for peacocks. Sadly we have lost a couple of our free ranging peacocks to foxes. The other main predators for peacocks are cars. Peafowl have very little road sense and on a hot sunny day the tarmac on a road gets lovely and warm and is a very nice place to sunbathe. For Peachicks there are a few more predators. Birds of prey will take a young peachick, rats will eat peafowl eggs. Cats and dogs can also be a concern for young peachicks. Even with our free roaming peacocks we try to pen them up at night. This can be achieved by feeding in the morning and then again at night. Consequently they are encouraged to come home for food. Fresh clean water should always be available. If you train the peafowl to return home in the evening, this is easier if you start when the birds are peachicks. We tempt the birds into the pen with a trail of bread or other treats. There are no routine vaccines for peafowl. We worm our peacocks twice a year and treat periodically for mites with a red mite preparation. Peachicks stay with their mother for at least three months. The peachicks will sleep initially under the peahens body when first hatched. When the peachicks can fly and perch they sleep under the peahens wings, which she will spread out to keep them warm. The peachicks reach adult size at around 10 months and full maturity at two years old. I takes up to three years for the peacock to have a full mature tail and to reach full fertility.